Rain, Tears At Boston's Farewell To Kennedy America — its presidents, its senators, its people — said a final goodbye to Sen. Edward Kennedy on Saturday. Mourners braved a downpour to attend the funeral Mass for the late senator at Boston's Our Lady of Perpetual Hope Basilica. America — its presidents, its senators, its people — said a final goodbye to Sen. Edward Kennedy on Saturday. Mourners braved a downpour to attend the funeral Mass for the late senator at Boston's Our Lady of Perpetual Hope Basilica. From NPR News, this is ALL THINGS CONSIDERED. I'm Guy Raz. RAZ: Thousands gathered in Boston today to say goodbye to Senator Edward Kennedy. The men and women who have made - and still make - political history in this country came to honor the man President Barack Obama called the greatest legislator of all time. President BARACK OBAMA: The greatest expectations were placed upon Ted Kennedy's shoulders because of who he was. RAZ: In just a moment, we'll talk with NPR's Brian Naylor at Arlington National Cemetery, where Senator Kennedy will be buried this afternooon. But first to NPR's Robert Smith, who takes us through the day's events in Boston. SMITH: Friends of Senator Kennedy sometimes joke about how the senator would drag them out in a storm just to go sailing. This morning, he brought them out in the pouring rain one last time. The clouds opened up with a deluge as the plastic-wrapped casket of Senator Kennedy was taken up the stairs of the Basilica of Our Lady of Perpetual Help. Forty pallbearers, senators, congressmen, his wife, Vicki, watched from under black umbrellas. SMITH: Kennedy had plenty of time to plan his own funeral, and he chose a simple church in a diverse neighborhood. Despite the luminaries in the pews, the focus was on Kennedy and his message. Father Donald Monan led the services. Father DONALD MONAN: My dear friends, a few scant miles from here, the city on a hill stands less tall against the morning sky. And the sea out toward Nantucket is a bit more forlorn at the loss of one of its most ardent lovers. SMITH: Ted was the youngest son of Rose and Joe Kennedy, and he asked that at his funeral, the youngest generation of Kennedys should be the stars. His grandchildren, nieces and nephews remembered the words of the Kennedy patriarch. TEDDY KENNEDY: For my grandfather's commitment and persistence ..TEXT: KYLIE KENNEDY: That we will not in our nation measure human beings by what they cannot do. GRACE ALLEN: No matter what their color, no matter what their place of birth. MAX ALLEN: That every American will have decent, quality health care as a fundamental right and not a privilege. ROBIN LAWFORD: The work begins anew, the hope rises again, and the dream lives on. We pray to the Lord. Unidentified People: Lord hear our prayer. SMITH: That was young Teddy and Kylie Kennedy, Grace and Max Allen, and Robin Lawford. If there was a theme, it was that Kennedy never left anyone behind. Not the disadvantaged, not the sick, not his family. His son Ted Kennedy Jr. told the mourners how he lost a leg as a 12-year-old child. Soon afterwards, his father tried to get him out in the snow to go sledding. Mr. TED KENNEDY JR.: And I said, I can't do this. I'll never be able to climb up that hill. And he lifted me up in his strong, gentle arms and said something I will never forget. He said, I know you can do it. There is nothing that you can't do. We're going to climb that hill together, even if it takes us all day. SMITH: But this was at its core an Irish funeral so there was joking and singing. President Obama even used a family nickname for Kennedy: the Grand Fromage - the Big Cheese. Obama delivered a simple, nonpolitical eulogy, telling stories, then saying that he'll be left with a single, enduring image. President BARACK OBAMA: The image of a man on a boat; white mane tousled; smiling broadly as he sails into the wind, ready for whatever storms may come, carrying on toward some new and wondrous place just beyond the horizon. May God bless Ted Kennedy, and may he rest in eternal peace. SMITH: An honor guard carried Kennedy's casket out of the Basilica. His widow, Vicki, gave it one long look before it was lifted into the hearse. Ted Kennedy was leaving his birthplace, Boston, for the last time. Robert Smith, NPR News, at Our Lady of Perpetual Help in Boston. Sen. Edward M. Kennedy was buried at dusk Saturday during a private ceremony at Arlington National Cemetery near the resting places of his brothers, both felled by assassins' bullets four decades ago. It is a peaceful and poignant spot familiar to the longtime Massachusetts senator, who was known to often visit the graves of President John F. Kennedy and Sen. Robert F. Kennedy, sometimes to honor their births and deaths, sometimes to pause after attending the funeral of a fallen Massachusetts service member, often to take in the sweeping view across the Potomac River to the white-columned Lincoln Memorial. During the service, performed by Cardinal Theodore McCarrick, archbishop emeritus of Washington, and attended by about 200 family members and close friends, the late senator was honored with 21 volleys fired by a rifle squad. His wife, Victoria, whom many credit with helping Kennedy remake his life and legacy, received the American flag that had draped her husband's coffin. Kennedy died Tuesday of brain cancer at age 77. He was the third longest-serving senator in the nation's history, the surviving patriarch of a wealthy, politically prominent but star-crossed Irish-American family, and a larger-than-life symbol of liberal ideals and the fast-evaporating art of political compromise. Testifying to the influence he wielded during 47 years in the Senate, and to the nation's continuing fascination with the Kennedy family, thousands of tourists and mourners thronged Constitution Avenue, hoping for a glimpse of the cortege as it passed. Hear full audio of Saturday's service at the Our Lady of Perpetual Help Basilica in Roxbury, Mass. Hundreds of his Senate staffers, colleagues and friends massed on the steps of the U.S. Capitol to honor him, his widow and family with applause and a prayer as the hearse and entourage paused on its way to the cemetery, where Kennedy, an Army veteran, would join his brothers and 330,000 other service members and dignitaries buried there. Kennedy's journey in death had begun Thursday when, on a pristine Cape Cod afternoon, his casket was borne by hearse from the family compound in Hyannisport, Mass., to the John F. Kennedy Library in Boston for a two-day vigil and a Friday night celebration of his life. It continued early Saturday in a grand Boston basilica where Kennedy once prayed daily for his sick daughter, and where President Obama eulogized the late senator as a man who faced down tragedy and personal failings that could have "broken a lesser man," emerging as the "greatest legislator of our time." "Through his own suffering," Obama said, "Ted Kennedy became alive to the plight and suffering of others — the sick child who could not see a doctor, the young soldier sent to battle without armor, the citizen denied her rights because of what she looks like or who she loves or where she comes from." Kennedy became a great lawmaker, Obama said, not only by deal-making, but by "seeking compromise and common cause" — sometimes cajoling recalcitrant opponents with cigars, cookies and song. "Though it is Ted Kennedy's historic body of achievements we will remember, it is his giving heart we will miss," Obama said. "It was the friend and colleague who was always the first to pick up the phone and say, 'I'm sorry for your loss,' or 'I hope you feel better.'" More than 1,500 people had filled the pews for the funeral at Our Lady of Perpetual Help Basilica, including former presidents George W. Bush, Bill Clinton and Jimmy Carter, and scores of Kennedy's Senate colleagues, past and present, Republican and Democrat. But it was the familiar Kennedy faces, masked again in sorrow, and the voices of his young grandchildren that served as the greatest reminder of the historic sweep of Kennedy's life — its arc of promise and unimaginable tragedy, of disgrace and redemption, and, ultimately honor. The president delivered the eulogy for Sen. Edward Kennedy at Our Lady of Perpetual Help Basilica in Roxbury, Mass., Saturday. There was his sister, Jean Kennedy Smith, 81, who, after losing her older sister Eunice just weeks ago, is now the last of the nine siblings who were part of the nation's most famous Irish-American Family. There was Ethel Kennedy, 81, widow of Robert, and Caroline Kennedy Schlossberg, 51, daughter of the late President Kennedy. There was Kennedy's ex-wife, Joan, 72, the mother of his three children. And there were scores of other Kennedy nieces and nephews, some now with hair as white as their uncle's had been. Kennedy's eldest child, Ted Kennedy Jr., 47, spoke movingly of losing his leg to cancer at age 12 and his dad's insistence soon after that they head out on a snowy day to go sledding. Young Ted, still getting used to his prosthetic leg, fell on the ice and began to cry, insisting he'd never be able to climb the hill. 10:30 a.m.-12:30 p.m. Funeral Mass at Our Lady of Perpetual Help Basilica in Boston. 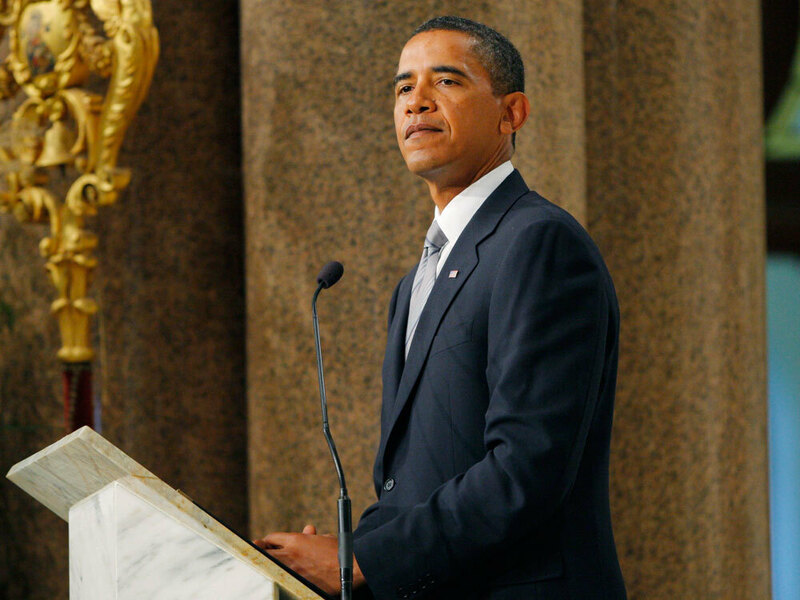 President Obama to deliver eulogy. Approx. 1:30 p.m. Remains depart from Hanscom Air Force Base. Approx. 3 p.m. Arrival at Andrews Air Force Base. Approx. 4:30 p.m. Arrival at U.S. Capitol. Motorcade will stop at the Senate steps for a brief prayer. 5:30 p.m. Burial service at Arlington National Cemetery. Closed to the public. Kennedy's grave is open for public visitation. "He said, 'I know you can do it. We're going to climb that hill together if it takes us all day,' " Ted Jr. said. "And I knew I was going to be OK."
"Knowing what my cousins have been through," he said, "I'm thankful I had him as long as I did." Obama spoke of the role Kennedy shouldered when his brothers were killed in their 40s, leaving behind 13 fatherless children. "Ted Kennedy was the father who looked after not only his own three children, but John's and Bobby's as well," the president said. "He took them camping and taught them to sail. He laughed and danced with them at birthdays and weddings; cried and mourned with them through hardship and tragedy." The youngest of the senator's three children, Rep. Patrick Kennedy, also offered emotional remembrances of his father, and cellist Yo-Yo Ma and operatic tenor Placido Domingo performed Cesar Franck's solemn, haunting "Panis Angelicus" during communion. Obama, whose remarks came at the end of the service, spoke fondly of the familiar red-faced, bellowing force-of-nature who spent nearly five decades in the Senate and helped shape landmark laws that gave the least powerful opportunity and voice — from the Civil Rights and Americans with Disabilities acts, to his work on children's health care. The president echoed the scores of stories of Kennedy's quiet kindnesses, large and small, that have been told in the days since he succumbed to brain cancer Tuesday night. He recalled that as a new senator he had admired a Cape Cod seascape Kennedy had painted, and a short time later the painting came to him as a gift from his senior colleague. Kennedy and his wife, Victoria, also gave the new president and his family their first dog, Bo. But perhaps the most valuable gift went unmentioned: Kennedy's endorsement last year of Obama instead of New York Sen. Hillary Clinton during their hard-fought battle for the Democratic presidential nomination. Clinton, now secretary of state in Obama's administration, attended the funeral with her husband, the former president. "The greatest expectations were placed upon Ted Kennedy's shoulders because of who he was," Obama said. "But he surpassed them all because of who he became. "We do not weep for him today because of the prestige attached to his name or his office," he said. "We weep because we loved this kind and tender hero who persevered through pain and tragedy — not for the sake of ambition or vanity; not for wealth or power; but only for the people and the country he loved." The Mass was a somber counterpoint to the previous night's memorial service, which resembled an Irish wake — full of laughter, tears, song and recollections by friends and longtime colleagues, both Democrats and Republicans, about the larger-than-life figure. Friends and colleagues who packed the Kennedy library talked not only about his derring-do and love of fun, his love of his Irish heritage and Massachusetts, but about his long commitment to the less fortunate and his unshakable belief that government could be a force of good. "John Fitzgerald Kennedy inspired our America, Robert Kennedy challenged our America, and our Teddy changed America," Democratic Sen. Chris Dodd of Connecticut, who served with Kennedy in the Senate for nearly three decades, said during a memorial service Friday night. As the skies darkened over Arlington cemetery Saturday evening, a bugler played "Taps," and the Kennedy clan, saying yet another goodbye, left the senator and his brothers on their hill. The cemetery re-opens to the public at 8 a.m. on Sunday, with thousands expected to pay tribute to the Kennedy patriarch.